The geomorphology and vegetation of marsh-dominated coastal lowlands were mapped from airborne laser data points collected on the Gulf Coast of Florida near Cedar Key. Surface models were developed using low- and high-point filters to separate ground-surface and vegetation-canopy intercepts. In a non-automated process, the landscape was partitioned into functional landscape units to manage the modeling of key landscape features in discrete processing steps. The final digital ground surface-elevation model offers a faithful representation of topographic relief beneath canopies of tidal marsh and coastal forest. Bare-earth models approximate field-surveyed heights by + 0.17 m in the open marsh and + 0.22 m under thick marsh or forest canopy. The laser-derived digital surface models effectively delineate surface features of relatively inaccessible coastal habitats with a geographic coverage and vertical detail previously unavailable. 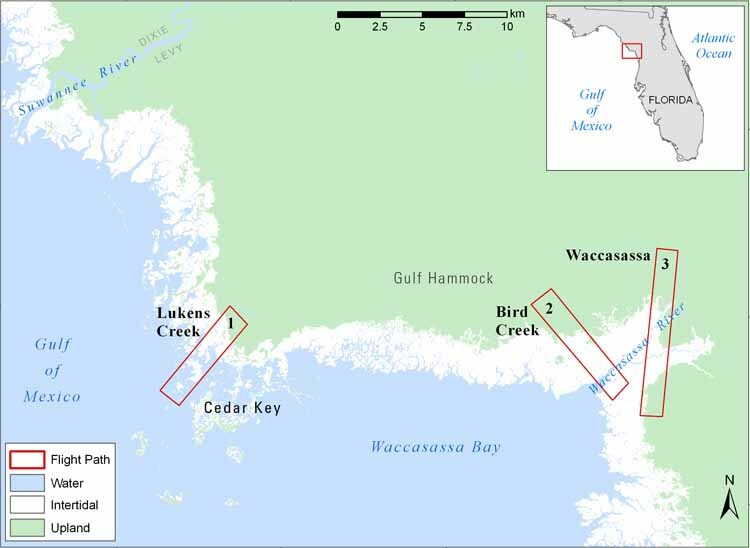 Coastal topographic details include tidal-creek tributaries, levees, modest topographic undulations in the intertidal zone, karst features, silviculture, and relict sand dunes under coastal-forest canopy. A combination of laser-derived ground-surface and canopy-height models and intensity values provided additional mapping capabilities to differentiate between tidal-marsh zones and forest types such as mesic flatwood, hydric hammock, and oak scrub. Additional derived products include fine-scale shoreline and topographic profiles. The derived products demonstrate the capability to identify areas of concern to resource managers and unique components of the coastal system from laser altimetry. Because the very nature of a wetland system presents difficulties for access and data collection, airborne coverage from remote sensors has become an accepted alternative for monitoring wetland regions. Data acquisition with airborne laser represents a viable option for mapping coastal topography and for evaluating habitats and coastal change on marsh-dominated coasts. Such datasets can be instrumental in effective coastal-resource management. To access the information contained on this disc, use a Web browser to open the file index.html. This report is divided into four sections: Open-File Report, Data, Metadata, and Contact Information. Links at the top of each page provide access to these sections. This report contains links to the USGS and collaborators or other resources that are only accessible if access to the Internet is available while viewing these documents. This DVD publication was prepared by an agency of the United States Government. Neither the United States Government nor any agency thereof nor any of their employees makes any warranty, expressed or implied, or assumes any legal liability or responsibility for the accuracy, completeness, or usefulness of any information, apparatus, product, or process disclosed in this report or represents that its use would not infringe privately owned rights. Reference therein to any specific commercial product, process, or service by trade name, trademark, manufacturer, or otherwise does not constitute or imply its endorsement, recommendation, or favoring by the United States Government or any agency thereof. Although all data and software published on this disc have been used by the USGS, no warranty, expressed or implied, is made by the USGS as to the accuracy of the data and related materials and (or) the functioning of the software. The act of distribution shall not constitute any such warranty, and no responsibility is assumed by the USGS in the use of these data, software, or related materials. This disc is readable on any computing platform that has standard DVD driver software installed. The minimum software requirements are a Web browser, Adobe Reader, and a text editor. If you cannot fully access the information on this page, please contact USGS Information Services at infoservices@usgs.gov or 1-888-ASK-USGS. Note: The only supported Web browsers that properly display all features of the interactive profiles are Internet Explorer 6 for Windows and Firefox 1.5 for all platforms. For further information about this project, contact Ellen Raabe at the Florida Integrated Science Center, USGS, St. Petersburg, FL. Jeffery DiMaggio, manager at Cedar Key Scrub State Preserve, provided invaluable field assistance and expert knowledge. Elzbieta Bialkowska-Jelinska, Jacobs Technology, Inc., provided editorial and mapping support. Michael Sartori, a graduate student with University of Florida Civil Engineering Department, provided technical support.